The window has a long and fascinating history. It has evolved in response to the availability of resources, developments in design and technology, and the demands of those who use them. At once functional and aesthetic, the window must keep out the weather, provide ventilation, prevent intruders and buffer sound. Windows are also integral to the appearance of buildings,reflecting the practice and taste of particular regions or periods. The window cannot be seen in isolation from the building fabric in which it is set. 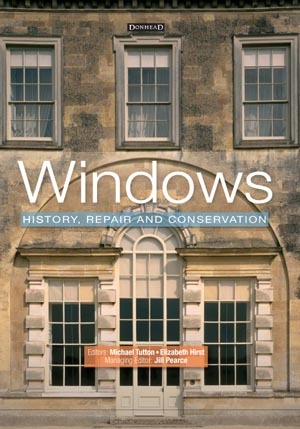 This book presents, for the first time, a comprehensive treatment of the history and conservation of windows. Bringing together the practical experience of conservation practitioners with the knowledge of leading historians in the field, it offers a unique understanding of the window structure. Part 1 covers the history of the window including the development in glass technology. It also provides an illustrated glossary of window types. Part 2 reviews the changes in policy andlegislation and discusses structural issues,decay mechanisms and the current stringent performance standards and how they affecthistoric windows. Part 3 focuses on the materials used in the construction of windows and the craft of leaded glazing. It details the appropriate techniques for repair and conservation. Windows is fully illustrated in both colour and mono to include over 400 high quality illustrations. Diagnosing Damp provides you with the knowledge and tools to understand the true causes of dampness in buildings and is packed full of features, case studies, checklist and photographs to aid correct diagnosis. "An essential reference for all those who wish to understand the often-complex causes and effects of dampness." "Diagnosing Damp provides an essential reference for all who wish to understand the often complex causes and effects of dampness. A clear and practical section on the science of dampness and sources of moisture sets the scene and helps debunk much of the misinformation that one sees in survey reports. Any volume on building defects and diagnostic practices runs the risk of loosing its readers in a mire of technical complexity and jargon. Here, this is not the case, and the authors should be congratulated for producing a comprehensive guide to an often-complicated subject. Diagnosing Damp – through its clear written style, easy-to-follow format, and level of illustration – stands head and shoulders above its competitors." A very easy-to-read and comprehensive book that deals with the problems of dampness in a thorough manner. Good format and layout split into three main sections that are logically set out to help the practitioner in the correct diagnosis of the causes of dampness in buildings. Part 1 looks at the science, sources of moisture and the management/cure of dampness; it does this in clear well written text with the help of useful tables, good quality sketches and excellent colour photographs. Part 2 covers survey advice and again is written in the same clear text with good quality sketches, tables and again both black-and-white and colour photographs. It considers the general principles of dampness investigations and in actual building elements, as well as a comprehensive look at the currently available equipment and tests. Part 3 puts the guidance into practice; it details a logical four-stage approach to dampness investigations and presents 11 detailed case studies to illustrate damp problems, their investigation and diagnosis. There are also some detailed appendices, one of which lists and discusses the legal implications and relevant legislation. In summary a very good book, worth the price and one that all those involved in the investigation and diagnosis of damp should read and certainly have a copy in their office. The arrangement of the book is both logical and very detailed without being too complicated for any surveyor to understand. The real attraction of this book, for me, is the inclusion of the case studies, which not only clearly identify the common damp problems often encountered, but also some of the common mis-identification problems that happen when trying to diagnose damp problems. The real world nature of these case studies gives me great confidence in the whole text book and I would rcommend it to any surveyor who should know about damp problems, or needs reminding of the nature, extent and complications that can occur when carrying out an accurate damp diagnosis.